This porcelain-enameled cast iron Dutch oven comes in a variety of exterior colors, with a cream-colored interior. While hand washing is recommended, it can be washed in a dishwasher, and it has a lifetime warranty. The pot is oven-safe to 500 degrees for baking or broiling and holds 6 quarts. It can be used on any cooktop, including gas, electric, or induction, but it shouldn’t be used on outdoor grills or over campfires. The tight-fitting lid helps retain moisture during cooking. Because of the double layer of enamel coating inside and out, this can be used for marinating, cooking, storing, and serving. This pot is an all-around winner, but comes with a steep price point. It’s big enough to prepare most dishes, but not so large that it is too difficult to move. It has an enamel coating so you can cook anything in it, and like most Dutch ovens it can be used on the stovetop or in the oven. The knob is either metal or a composite material that’s safe to 500 degrees Fahrenheit. For more versatility, the knob is removable, so if you need to cook at an even higher temperature, you can buy a replacement metal knob. The Le Crueset Dutch ovens come in a wide variety of colors to mix and match with anyone’s kitchen décor. Like other cast iron pots, this one is heavy—it weighs just over 11 pounds, and it can weigh 20 pounds or more when it’s filled with food. Le Creuset cast iron pots are made in France. And if you are looking for a larger size or prefer an oval shape, Le Creuset has those as well. If you’re not willing to spend a lot for a single piece of cookware, this Dutch oven offers many of the same features at a much lower price point. 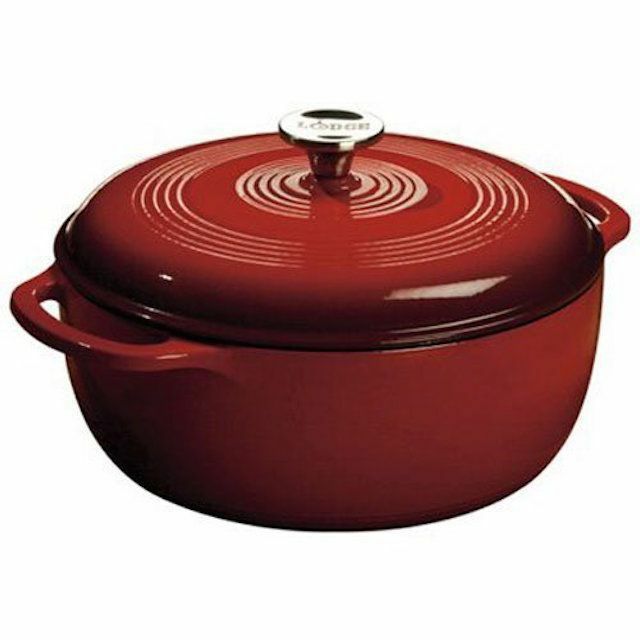 The large size is great for big families or large roasts or poultry, and the cookware is has a durable enamel coating. While this has a metal knob, the cookware is only rated to oven temperatures of 450 degrees Fahrenheit, so you won’t be able to use it for some of the no-knead bread recipes that require higher temperatures. This Dutch oven comes with a lifetime warranty from the manufacturer as well. The large stainless steel loop handle on this pot makes the lid easy to remove, even while wearing an oven mitt, and the matte-black enamel interior is less likely to show staining than the cream-colored interiors found in many other pots. The side handles are comfortable to hold with potholders or while wearing mitts, so it’s easy to get in and out of the oven, and it’s safe to 500 degrees Fahrenheit when baking. 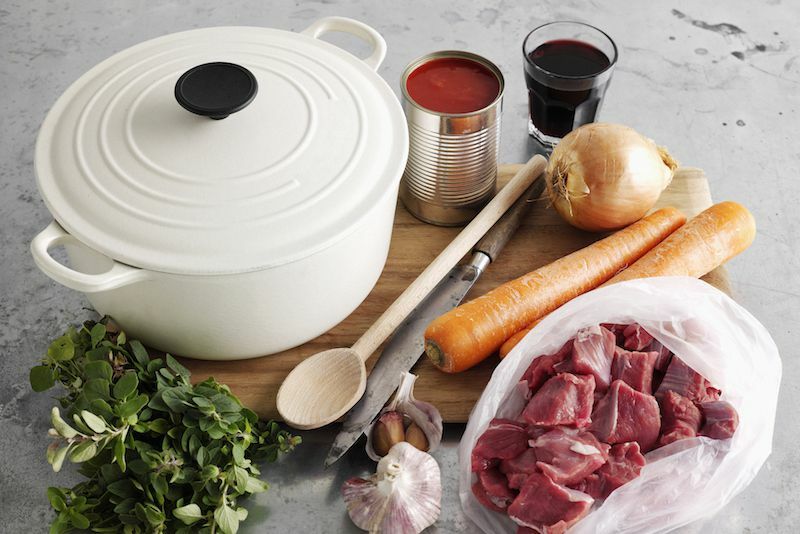 The underside of the lid has little nubs that cause condensation to rain down on food and help baste your stew or roast while cooking, and the pot is broiler safe, so you can brown the top of the food after you’ve simmered or braised it with the lid on. Right now, this cookware is only available in one color, a rich red. Since it’s a fairly new line, there aren’t as many pieces available as are available from other manufacturers. This raw cast iron Dutch oven comes pre-seasoned to give you a head start on getting a perfectly non-stick pot. But that’s not the best part. The lid of this Dutch oven doubles as a skillet with two side handles, so you get two pots in one for an incredibly low price. Simmer your soup in the pot and make cornbread in the skillet at the same time. The downside of the skillet feature is that the lid doesn’t have a top handle for lifting. Raw cast iron cookware is safe for use at any oven temperature as well as on an outdoor grill or campfire. At super-high temperatures (oven-cleaning temperatures), the seasoning can burn off, but it won’t hurt the cookware, you would just need to season it again. This pot is wider and slightly shorter than other pots of the same size, but you can still fit an average-sized chicken in the pot. Meanwhile, the larger bottom surface means you can brown more food at one time before braising. This cookware is known for more even browing with fewer hot spots than some of its competitors, and it has a black interior that is less likely to show food stains. Nubs on the interior of the lid send moisture raining down on the food for self-basting. The top knob is small, but raised high enough to make it easy to grasp when removing the lid. The lid is oven-safe to 500 degrees Fahrenheit, while the pot can handle up to 900 degrees Fahrenheit. This cookware is made in France and is available in several different colors. Going camping? This camp-style uncoated cast iron Dutch oven has feet to elevate it over hot coals, and the flat lid is designed so you can place coals on top for heating on top. The tight-fitting lid keeps moisture in during cooking, and can also be used as a griddle. The Dutch oven arrives pre-seasoned, so you can pack it for your trip as soon as it arrives, but the coating will improve with additional seasoning and use. This holds 8 quarts, and is made in America. It has loop handles that make it easy to move, even with bulky oven mitts. This should be cared for like any other cast iron cookware; it is not dishwasher safe. While this is oven-safe, it might be awkward to use because of the legs. It might work on a gas cooktop, depending on your stove grates. It will not work well on an electric or induction cooktop. Round Dutch ovens are the most common, but there are times when a square Dutch oven is the better choice. This square Dutch oven is perfect for making even rows of biscuits or buns or for baking cornbread or brownies, but it’s just as good for roasts, casseroles and ​more since it has a roomy 8-quart volume. The Dutch oven and lid are pre-seasoned, so you can use it right away, but the surface becomes even more nonstick with extra seasoning and use. The lid is reversible and has raised ridges so it can also be used as a stovetop grill. With cookware, bigger isn’t always better. This 3-quart Dutch oven is great for side dishes or small servings of soup, chili, stew and more, and it’s lighter and easier to move than larger pots that weigh more. The high-gloss exterior enamel coating will look attractive for years to come, and the interior coating means this will never need to be seasoned. The cookware is safe to 400 degrees, and can be used on any cooktop, including induction. This should be hand washed.